VMAC provides funding for assemblies district-wide. These programs have dealt with issues affecting all students. Programs have targeted bullying, personal choices, and internet safety. VMAC funds the purchase of character education/drug and alcohol prevention materials for all Verona school libraries. In addition, VMAC funds specific programs targeted to each school. Dream Team (Daring to Reach out to Each other And Make a difference) is a community-based service club. Team members learn and practice leadership skills under the guidance of advisors. The students plan and participate in community service projects, drug free and violence awareness activities as well serve as positive role models for the school community. Click here for more information. 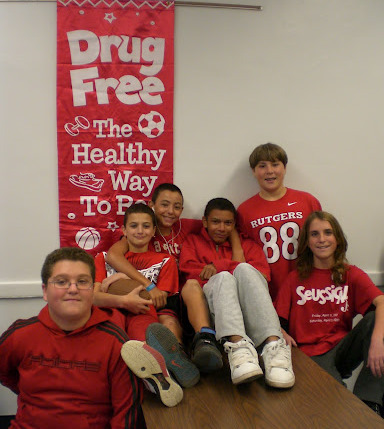 Red Ribbon Week is a national drug prevention campaign. It generally takes place during the last week of October to celebrate the many reasons and ways to stay drug-free. The students participate in contests and programs that highlight ways to say no to drugs and practice refusal skills. Heroes and Cool Kids is a program that utilizes the services of current and former professional athletes whose personal life experiences enable them to train high school student leaders to mentor middle school students on important life skills. These life skills include sportmanship, conflict resolution and positive lifestyle choices, highlighting drug, alcohol and tobacco prevention. VHS students are chosen by application for training and make three site visits to fifth grade classes at HB Whitehorne Middle School. through an adventure based counseling model. Juniors and Seniors apply to be Peer Leaders in the Spring. Meetings and trainings are scheduled throughout the year during and after school. Students lead discussions with small groups of freshmen to ease the social and academic transition from middle school. Click here for more information. the signs of alcohol poisoning and NJ’s 911 Lifeline Law that provides immunity to those who call for help. Make the call and save a life! Aware Awake Alive (www.awareawakealive.org) prevents loss of life to alcohol poisoning by educating teens, young adults and parents on the dangers and symptoms of alcohol overdose. They generate awareness and dialogue around amnesty-based policy and legislation, and create an atmosphere of partnership in which young people, parents, educators, and like-minded organizations share responsibility for supporting and educating one another. Project Graduation VMAC makes a yearly donation towards the costs of the drug-free party provided to the graduating class so that their celebration is alcohol and drug free, safe and fun.